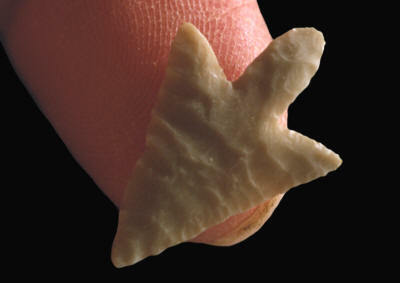 Cast of a small stemmed arrow point from Saudi Arabia. This stemmed arrow point was collected several years ago on a site located in east central Saudi Arabia, just west of Qatar. It's unique, not for it's type, but for it's very thin cross section. Only a small area of the original surface of the flake, from which it was made, can be seen on each side. It was made by someone who could do very skillful and delicate pressure flaking. This stemmed arrow point measures less than 1/16 on an inch (1.3 mm) thick. It dates to sometime during the Neolithic period between 5,000 and 7,000 years ago. Small stemmed arrow points were used by many different cultures in widely separated areas of the world. Stemmed points were one of the more popular arrow point styles that were used by late Stone Age bow hunters. The stemmed bases would have allowed for easier hafting if they were being fitted onto the ends of reed arrow shafts.